For over 30 years ATC Flight Simulator Company has been in the business of a manufacturing FAA-approved, realistic and affordable flight simulators, featuring fixed-wing, rotorcraft and Flight Training Devices for general aviation, commercial, US forestry service and military aircraft. The simulators provide ATC pilots and owners the ability to practice cockpit familiarization, flow patterns, emergency procedures, as well as basic and advanced proficiency training. ATC is known for building high quality, rugged products designed to meet the rigors of daily training use. That's why ATC Flight Simulator has the second largest installed base of all simulators operating in the United States. ATC boasts extremely popular models such as ATC-610, ATC-710, desktop control panels, ATC-112H, helicopter, ATC-810, ATC-820, twin engine and ATC-920. 1900 turbo prop aircraft. ATC training devices can be equipped with motion platforms, 180° or 220° projected or high definition monitor display systems. ATC's newest technology is interactive simulation where multiple simulators are interconnected allowing pilots to see each other and talk to each other in complete scenario simulation environments. One instructor can see and talk to multiple students at the same time. Two instructors can work and teach both the VFR and IFR students at the same time from either of two instructor consoles --- the VFR instructor console or air traffic control radar console. 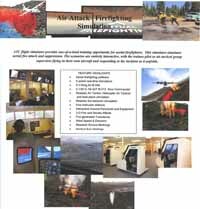 ATC's new Virtual-Fire Fighting interactive technology uses multiple simulators and is being used by the US Forest Service with eight different simulators in a scenario based simulation. 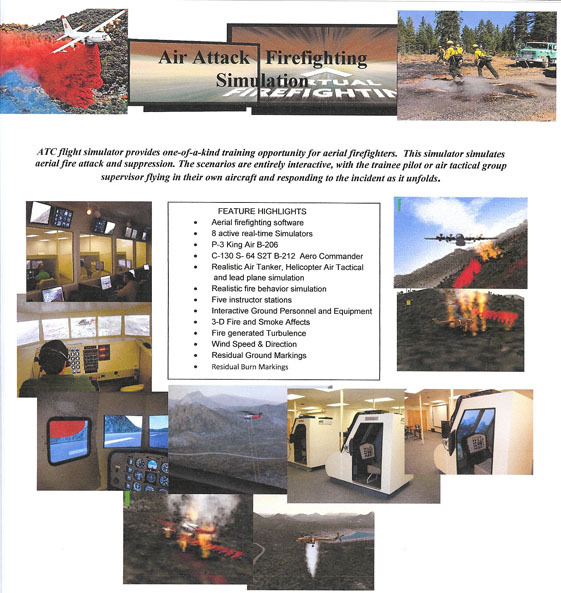 It provides trainee pilots an opportunity to experience operations inside the fire traffic area with other participants working the same fire simultaneously, seeing and interacting with each other. Numerous states and foreign countries want to apply this technology to their police and fire operations. 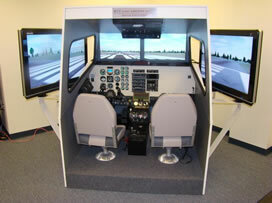 Let ATC help you apply the latest technology for your simulation and training needs.